1. Heat olive oil in a large saucepan on medium heat. Add tomatoes and sauté until soft. 2. Add tomato paste. Cook for 5 minutes. 3. 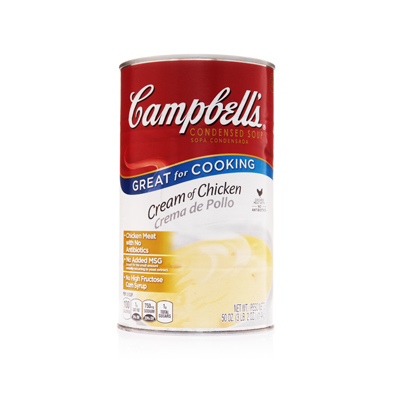 Add water, Campbells® Cream of Chicken Condensed Soup, garlic, thyme and basil. Bring to a boil then reduce heat to a simmer for 10 minutes. 4. Blend sauce and slowly add liquid smoke. Blend until smooth. Serve warm. If liquid smoke is unavailable, roast or smoke the tomatoes before cooking. Best alternate herbs are rosemary, sage or oregano. For deeper flavor, cook the tomato paste. Perfect with Italian-inspired dishes, grilled or sauteed pork cuts like loin and chops, chicken, beef tenderloin, and flat iron or skirt steak.